Christopher D. Armstrong - Mecanica Scientific Svcs Corp. The last ten years have seen explosive growth in the technology available to the collision analyst, changing the way reconstruction is practiced in fundamental ways. The greatest technological advances for the crash reconstruction community have come in the realms of photogrammetry and digital media analysis. The widespread use of scanning technology has facilitated the implementation of powerful new tools to digitize forensic data, create 3D models and visualize and analyze crash vehicles and environments. The introduction of unmanned aerial systems and standardization of crash data recorders to the crash reconstruction community have enhanced the ability of a crash analyst to visualize and model the components of a crash reconstruction. Because of the technological changes occurring in the industry, many SAE papers have been written to address the validation and use of new tools for collision reconstruction. Collision Reconstruction Methodologies Volumes 1-12 bring together seminal SAE technical papers surrounding advancements in the crash reconstruction field. 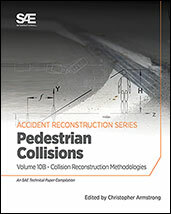 Topics featured in the series include: •	Night Vision Study and Photogrammetry •	Vehicle Event Data Recorders •	Motorcycle, Heavy Vehicle, Bicycle and Pedestrian Accident Reconstruction The goal is to provide the latest technologies and methodologies being introduced into collision reconstruction - appealing to crash analysts, consultants and safety engineers alike. If you do not have access to SAE MOBILUS via username/password or institutional access, you can still purchase the Progress In Technology (PT), Collision Reconstruction Methodologies Volume 10B: Pedestrian Collisions.